The media is no longer omnipotent. Gone are the days when newspaper publishers wrote what they wanted and local TV stations pushed their weight around the community. In today’s world, media companies are owned by public corporations that are driven by quarterly earnings. This means newspapers, local TV stations and television networks are afraid of controversy and lawsuits that can damage the parent company’s reputation. This evolving media is also constantly looking for new material and ideas, making it easier for you to pitch stories and shape coverage. Producers, reporters and writers all know their productivity is constantly being measured, giving them fewer days to turn original stories. You can put yourself on even footing with the media giants as long as you know which areas to exploit. It’s the one question every person wants to know. How do the news producers and newspaper editors decide what to publish? The fact is news selection is an art and just like any other profession involving creativity, opinions and experiences, it is subjective to where you stand. This chapter reveals a few universal codes in identifying whether a story deserves coverage. The insider knowledge will help you proactively shape your message, which will increase your chances for coverage. You will never be the first person to call a reporter or producer with a story idea. Viewers and readers bombard journalists’ email and voicemail boxes with crazy complaints and worthless ideas, diluting the credibility for everyone. This is why you must prepare your approach before any initial contact with the media. The Ten Commandments will guide you through the media maze, help you find the right angle to pitch, and show you how to locate the right reporter for your story pitch. You’ve agreed to sit down with a reporter for an interview, now how do you prepare for the difficult questions? The interview is the most critical element of any story because the allegations against you will drive the questioning, and how you respond to those questions will either help or hurt your case. What you say will also lead to how the story is shaped. Certain questions require a clear-cut response, while others might need the eloquence of a philosopher. This chapter teaches you how to apply the philosopher’s handbook when controversial and confrontational interviews begin to unfold in front of the camera or with a newspaper reporter. Before you field any calls from the media, you need to insert a “screener” to ask the reporter five specific questions. The screener shouldn’t have any authority within your business so his actions and words can’t be used against you. In t heory, the screener will be a person who is unaccountable, someone like a spouse or secretary. By asking these questions, your screener will help you determine how big of a threat you face, the strength of your opponent and what your next step should be. The bigger your threat, the more you must prepare for this story. How you respond to the reporter’s first questions will greatly influence whether the negative story against you continues or is shelved. The reporter might have documents to support your malfeasance, or a victim to lend credibility to the allegation, but until he talks to you over the phone, for all practical purposes, this reporter has nothing more than gossip. And gossip isn’t worthy of a news story. Every reporter needs to hear your response to the allegations, and depending on what you say over the phone or how you act in person, it will influence whether the story is killed or pursued. You may not get the story killed by following these Ten Defensive Decrees, but by ignoring them it is almost certain that a negative story against you will proceed. Once you discover the scope of your threat, you need to fight the story from within the news organization. You can’t go to war without knowing a country’s terrain, and likewise, you can’t fight a negative story without understanding how a newsroom operates. This chapter will teach you how to identify strategic power players within a news organization and how to approach them. Different news people have various levels of influence in killing a story. The challenge is locating the proper ally or target within the news organization, and appealing to his self-interest and/or self-preservation. Newsrooms have hierarchies just like any other corporation and government entity. Sales, Public Affairs, News, Executive and Legal Departments all have constituents they must service. By understanding and approaching these different departments, you can find allies within a news organization to help get your story killed. Every person is vulnerable to mind games, and journalists are no exception. There are numerous actions -some subtle and some more blatant - you can take before and during an interview to hold the reporter more accountable. If done properly, these maneuvers will make the reporter or producer uneasy about pursuing your story. Some tactics, like using a speakerphone, have subtle implications. Others, like videotaping the interview, show you mean business. The media is afraid of lawsuits, and by utilizing these unconventional tactics you can better exploit that fear to squash your story. The better you position yourself against the journalist, the more likely you will ensure a fair and balanced story. Every reporter will ask for an interview to get your side of the story. Don’t ever say, “no comment,” even if you don’t want to talk about the issue. It will only make you look guilty. Instead, learn how to say no by saying yes. In some cases, you can communicate this by setting conditions and time frames that will be impossible for the reporter to meet. This chapter will help you assess when it is best to decline an interview and when it is better to face the tough questions head on. It will also teach you how to craft the best statement should you decide not to talk on camera, along with some actual statements given to the media. There comes a time when firefighters must start fires to keep the flames from spreading. To the outsider, it might sound counterproductive, but it serves a purpose. It contains the damage. If your negative story is starting to spread from print to television or from the Internet to newspapers, it might be time to apply the firefighter strategy. This chapter explains when it is best to face a negative story head on. In some situations, you need to start mini-fires, or apply diversion tactics to take better control of the story. It will also teach you how and when to take your problem public to better manage the situation and spin the message. Your story has run in the morning newspaper or aired on television. Now what? In the moments before and after a story runs, you must be conscious of the public’s perception and opinion. Regardless of whether the story was negative or positive, it is now time to reinforce your message with the public. If the story was positive, you can use this article as a base to pitch other mediums on the same topic. If the story is negative, you might need to spin the message with the public. Most businesses fail to take advantage of this step after a story has run even though in many cases, they have momentum. 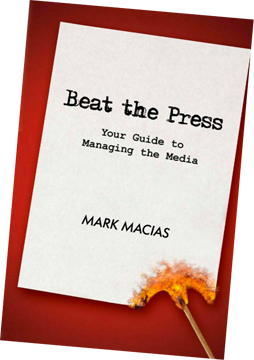 This chapter will also teach readers how to create a public relations campaign to repair any possible negative reaction from a story.